In Māori tradition, people and forests are vitally connected – both were created by the god Tāne. A magical realm guarded by lizards, birds and other creatures, the forest also provided Māori with the necessities of life. They depended on its trees and shrubs for food, medicines, building materials and clothing. Tāne, who separated his parents Ranginui (the sky) and Papātūanuku (the earth), is the god of the forest. The tallest forest trees, including tōtara, kauri and beech, are called the posts of heaven – they hold the sky up and away from the earth. The life force or mauri of a forest could be held within stones and guarded by lizards. Tohunga (priests) recited prayers to protect or increase the mauri. When Māori chopped down trees or took food from the forest, they showed their respect by performing special rites. Some plants growing wild in the forest were food for Māori. They ate the roots and shoots of tī (cabbage trees), and the berries of hīnau and poroporo. The kernels of karaka were important but poisonous, so were boiled for several hours and placed in running stream water for a week to make them safe to eat. The most important wild vegetable was aruhe (fern root) from bracken fern. The roots were dug up, dried, soaked in water, cooked by roasting or boiling, and pounded into a paste, which was made into cakes. The mashed leaves and bark of rimu helped to heal cuts and burns. Pōhutukawa nectar was good for sore throats. 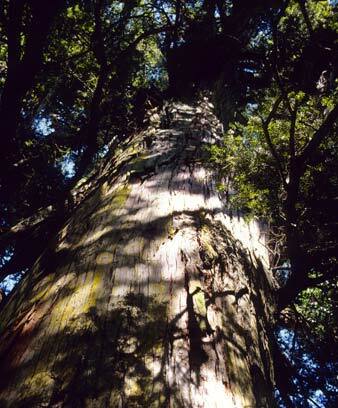 Large trees such as tōtara and kauri were carved into canoes. The trunks of tree ferns and nīkau palms were used for house posts, and the fronds for roofs. The branches of kōwhai and mānuka were easy to bend and were used to make snares to trap birds. Harakeke (flax) leaves were woven into clothes, baskets and sails. The fibre was made into cord, used when making tools, fences, houses and canoes.